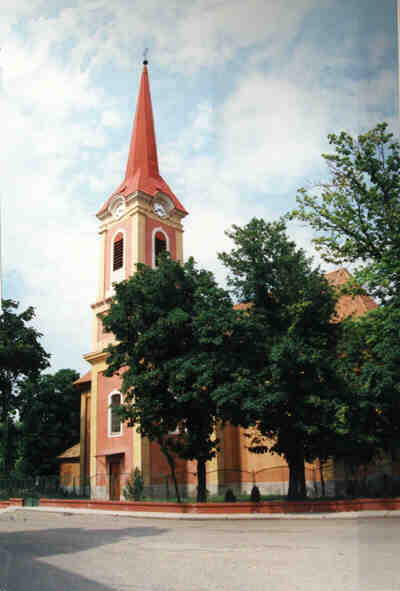 Village Tvrdošovce is situated in the Podunajská lowland at the lower flow of the Váh river, 10km to the northwest of the district Nové Zámky. Terrier of village with extension of 5556ha is plain, 120m above sea level. With number of inhabitants (5150) belongs to the biggest rustic villages of Slovakia. 80% of inhabitants is of Magyar nationality and 20% of Slovak nationality. A big part of inhabitants deal with agricultural small-scale production (farmers), because of very good conditions in the village. Access to the village is by road of the first class No.75 passing through the centre of village and by railway route Bratislava - Nové Zámky - Štúrovo. The first written mention about village is from the year 1221 when was donated by Ondrej II. to the Monastery "Heiligenkreuz", but signs of settlement of our village come from the Bronze Age. The Church of St Stephan: appearance of present-day from the first half of the 18th century. Frescos decorating the interier of the Church come from the Master Jakubeya. In the Church there is a small museum with worth clerical and historical relics. The Rákoczi monument: was built on a place where the Earl Bercsényi sent three important letters to F.Rákóczi II. in the year 1704. The Cenotaph: was consecrated in the year 1941 and many commemorative tablets with names of dead soldiers (fellow-citizens) from World War I. and II. and during the Revolution in the year 1848 are here. The Curia: served as a seat of local yeoman Juhásza. Now it serves as a restaurant.